COMPANY PROFILE eBay Inc is a commerce platform and provides online marketplace for sale of goods. Its marketplace platforms include its online marketplace located at www.ebay.com, its localized counterparts and the eBay mobile apps. With $88 billion in gross merchandise volume transacted in 2017, eBay’s Marketplaces facilitated around 4% of the $2.3 trillion global online commerce market. eBay’s current strategic priorities include revitalizing its Marketplaces platform by highlighting its unique product assortment and value proposition, improving the seller and buyer experience, utilizing structured data/artificial intelligence for listings, and improving its mobile commerce capabilities. eBay will partner with Netherlands-based Adyen for payment intermediation beginning in 2018. 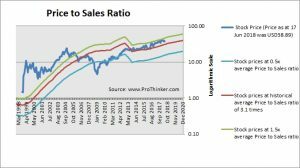 At the price of USD38.89 as at 17 Jun 2018, Ebay Inc is trading at a Price to Sales Ratio of 3.9 times last 12 months sales. This is a 26.0% premium to its historical average Price to Sales Ratio of 3.1 times.